Survival in a war zone is a daunting reality for 200 million people today. An additional 50 million people have been displaced by violence, more than at any time since World War II. Among these quarter billion people, women and children pay a particularly high price, with more than half of all maternal and child deaths now occurring in crisis settings where mortality rates are four times higher than noncrisis settings, according to Save the Children’s 2014 State of the World’s Mothers report. Bringing lifesaving interventions to pregnant women, mothers and children living in crisis settings is thus becoming a new and recognized frontier in the battle to achieve the Millennium Development Goals. Addressing maternal and child survival in crisis settings starts with a recognition that deaths in these environments are overwhelmingly driven by preventable infectious diseases and malnutrition, and not by trauma, as many suspect. The same interventions that are now resulting in record low mortality in nonconflict areas — vaccines, antibiotics, nutritional supplements and maternal education — are similarly effective in crisis settings. However, a 2014 report by Médecins Sans Frontières titled “Where is Everyone? Responding to Emergencies in the Most Difficult Places” asserts that despite unprecedented amounts of funding, humanitarian aid is failing to effectively and comprehensively protect the most vulnerable people who are living in the least accessible and most dangerous places. With less than 500 days to meet the 2015 deadline for the MDGs, those who deliver aid in crisis settings must find more efficient and equitable delivery strategies to reach women and children. Delivering effective interventions to hard-to-reach populations in challenging circumstances is never an easy task. Nevertheless and even in crisis settings, we are not starting from zero. Services do get through, but they tend to be single-focused services: polio or measles vaccination campaigns or general food distributions. Typically, services in crisis settings are vertically fragmented with distinct funding silos, supply chains and delivery points. To save the lives of at-risk women and children in crisis settings, we must ensure that we do not miss opportunities to leverage what already exists. The MDG Health Alliance has produced five road maps outlining strategies to save an additional 1 million children and 160,000 mothers by the end of 2015. These documents share a primary concern for hard-to-reach populations and unite around a central concept: We must more effectively leverage existing outreach platforms to reach people with the most important life-saving interventions targeting the leading causes of death. By bundling together delivery of vaccines, medicines and/or food supplements, we can prevent and treat pneumonia, diarrhea, malaria and malnutrition more effectively, and save more lives in the process. One of the most promising strategies is to combine delivery of food supplements and vaccines for children in crisis settings. Nutritional deficiencies account for five of the 10 top risk factors for death in children under 5, and vaccine-preventable infections are responsible for a quarter of all under-5 deaths. There is growing evidence from sub-Saharan Africa that distribution of highly nutritious food tailored to meet young children’s needs lowers mortality rates. Not surprisingly, combining nutritious food with vaccination gives a big bang for the buck. Aid agencies should be proactive in insisting that vaccine campaigns join forces with nutritious food supplement distributions. One of the special benefits of adding food supplements to other campaigns — beyond the significant mortality boost — is that provision of food also acts as an incentive to care seeking and to completing courses of treatment over time. Beyond this core activity, there are several other interventions that can be combined and delivered via health campaigns to fragile populations. 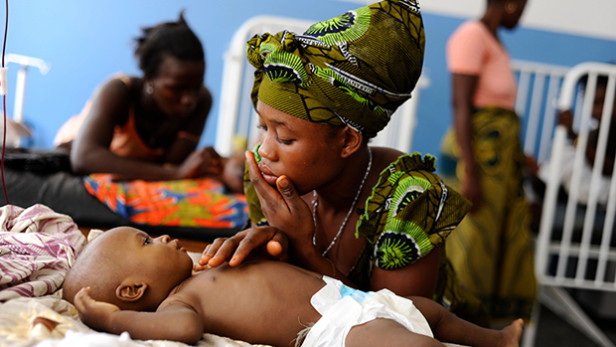 These include maternal health interventions such as providing contraceptives and drugs like misoprostol that protects against hemorrhage in childbirth and chlorhexidine that counters newborn infection; oral rehydration salts and zinc tablets that counter diarrhea, which is one of the most common ailments among children in crisis settings; and treatment for malaria prevention. One of the great values of integrating delivery of critical health interventions is that it improves the likelihood of a mother’s participation, because integration delivers a more efficient use of time in a challenging environment. By delivering multiple vaccinations, screening for malnutrition and distributing nutritious food in a single visit with her children once a month, a mother saves time, faces lower stress and is more likely to participate in service delivery moments. Mobilizing existing health outreach platforms to do more for women and children in crisis settings will require changes in the way the development community does business. Health ministries and the agencies that support them will need to view these platforms as resources in humanitarian emergencies and must become more comfortable delivering services to populations in crisis settings, regardless of whether these services are already available to the whole country. Humanitarian agencies also must focus more on preventive programming rather than curative approaches, which have been the long-standing approach to pneumonia, diarrhea and malaria for populations in crisis settings. Several specific actions are needed now: assuring that nongovernmental organizations have easy access to reduced prices for vaccines negotiated by the GAVI Alliance, strengthening the technical capacity of NGOs, and committing to better coordination within the U.N. system to deliver health interventions in crisis settings. Finally, new thinking is needed on ways to encourage and incentivize the agencies working on vaccines, nutrition, malaria, child health and women’s health to work in partnership rather than in isolation with one another to better serve the populations in crisis with integrated and comprehensive health services. UNICEF and the World Health Organization recently announced the largest polio campaign ever conducted in the Middle East, expected to reach more than 25 million children, 765,000 of whom live in Syria. We sincerely hope that they will take advantage of this precious opportunity to do more than provide a few polio drops. Eradicating polio is an important public health goal, but we have an obligation to keep the best interests of children at the forefront and to provide protection against the illnesses that most immediately threaten their survival. Check out more coverage of New York #GlobalDev week. Follow us on Twitter and like us on Facebook to get the latest from the high-level conferences and other related events happening this week.